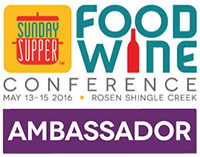 This week the #SundaySupper family is sharing the kids favorite recipes. 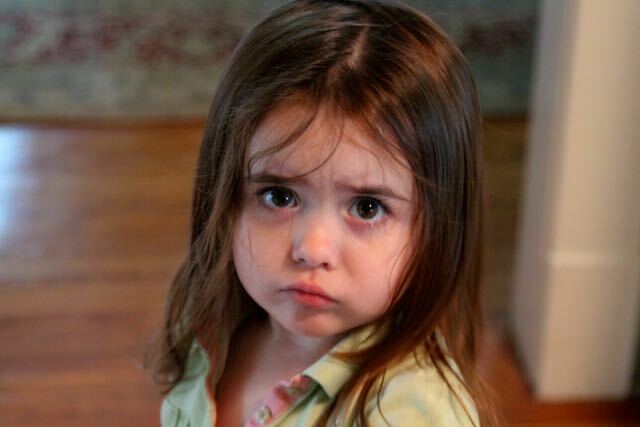 We have six grandchildren, extended family along with Nieces and Nephews so what’s their favorite? For this event I asked that question and the unanimous favorite was Whoopie Pies. Why? “Because it’s fun and that’s what we do with you”. That, my friends, is what the “Art of Gathering” is all about! 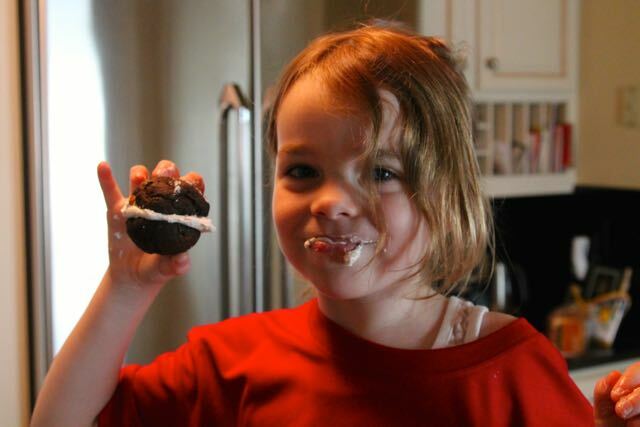 The other day I had our granddaughters for the afternoon and we made Whoopie Pies. This tradition started over fifteen years ago my Niece and Nephews were toddlers and we started baking cookies. 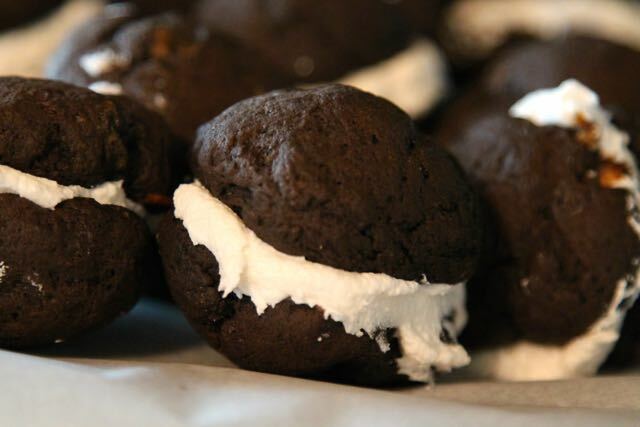 The Whoopie Pie quickly became the favorite so now that’s our “thing”. It is so much fun to share the experience with the children. They so enjoy adding the ingredients, dropping the dough onto the baking sheets, then licking the bowl and spoons. They always sample a cookie when it comes out of the oven and are disappointed in the flavor and texture. We have to remind them that this is not the finished product – they still need to make the filling. We have been doing this a long time – my neice and nephews are quadruplet survivors and just turned Eighteen and graduated from High School. I visited for their birthday and for graduation and they still ask for Whoopie Pies. It’s proved to be such a bonding tradition I started it with our Grandchildren. Last weekend Em & Cate came to visit but we ran out of time to make them. Hopefully we’ll have them back next weekend and I have everything we need for the task. 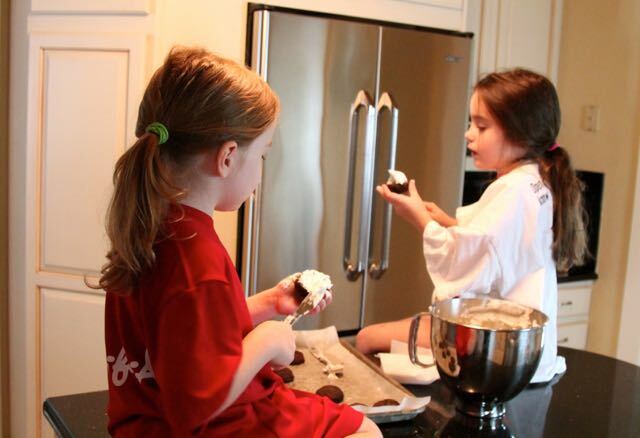 This week I had the youngest set of Grandchildren for an afternoon so I pulled their hair back, dressed them in my old shirts and introduced them to Whoopie Pies! I think they liked them…. 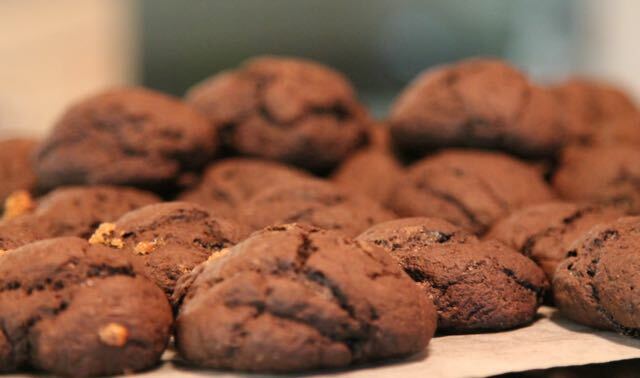 This recipe, from the King Arthur Flour Cookie Companion is the ultimate Whoopie Pie. I guarantee it will be a favorite in your household. I urge you to try it – you will make some friends. Preheat the oven to 350. Lightly grease (or line with parchment) two baking sheets. In a large mixing bowl, cream together the shortening, brown sugar and egg. In a separate bowl, wisk together the cocoa, flour, baking powder, baking soda and salt. Stir the vanilla into the milk. Alternate adding the dry ingredients and the milk mixture to the shortening mixture, beating until smooth. Drop the batter onto the prepared sheets (The recipe calls for ¼ cupful but I make mine smaller. You can decide the size – just make them uniform. You will have to match them up later.) about 2 inches apart. Bake for about 15 minutes, until they are firm to the touch. Remove them from the oven and transfer to a rack to cool completely. In a medium bowl beat all of the ingredients together. Spread half of the cookies with the filling; top with the remaining cookies. For best storage wrap each cookie individually. 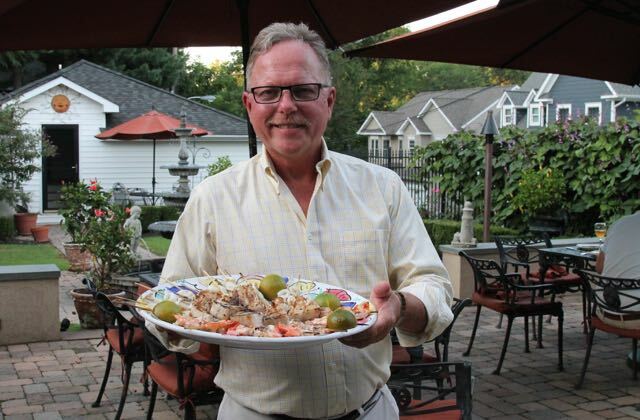 Special Thanks to Ellen Folkman – Family Around The Table for hosting this event!!!! Gumdrop Cookies by What Smells So Good? What a great tradition, Monica! 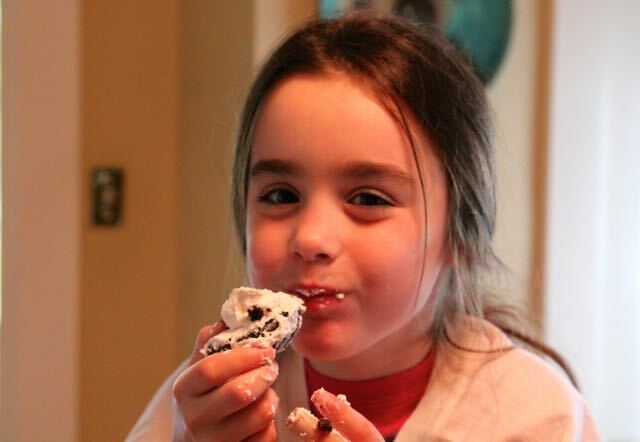 Lovely whoopie pies and your grandbabies are so cute too! Oh man it looks like your grandkids had the best time making and eating these. And who wouldn’t? 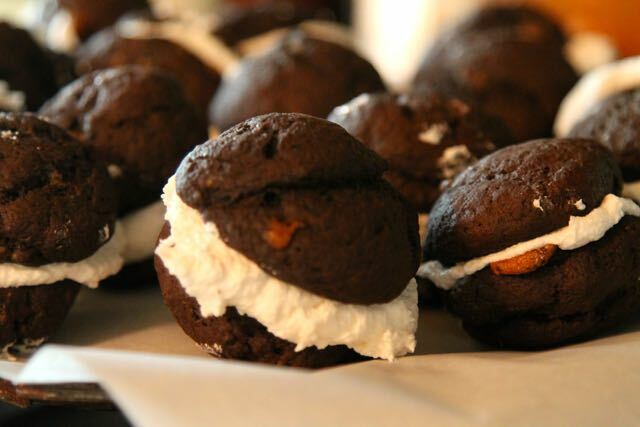 Whoopie pies are always a hit. Your grandchildren are adorable!!! 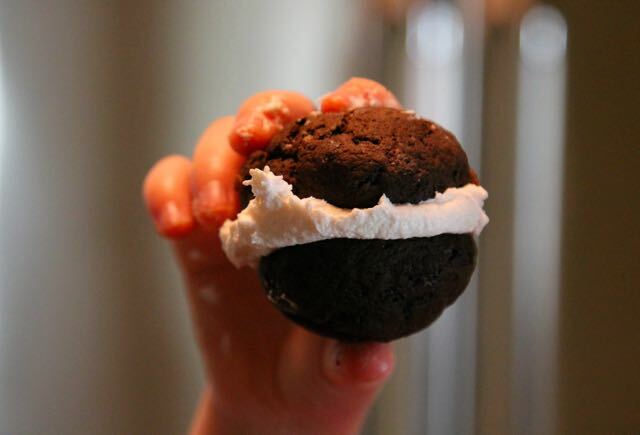 My kids and hubby all love whoopie pies and I’d love to treat them to your recipe! I have never had a whoopie pie! I can’t believe it! This looks fantastic! What a fun and delicious tradition! I’d love to come make some with you too! What fun! I made whoopie pies with my boys for Pi day. Messy fun. 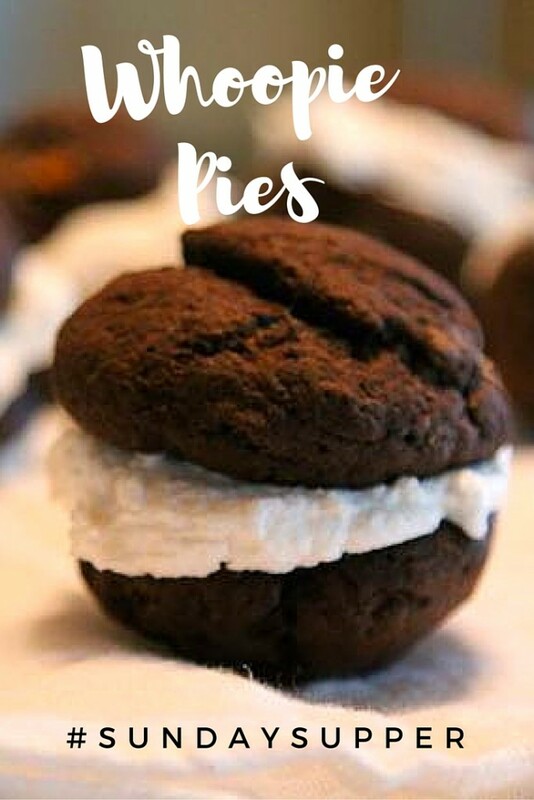 Love soft whoopie pies with a creamy center! 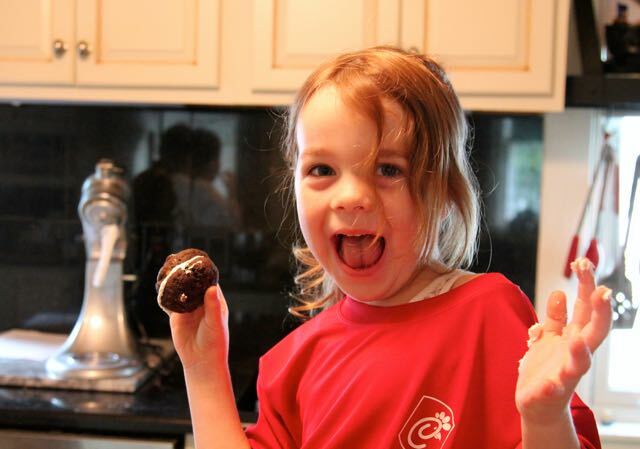 Your little ones make great helpers and taste testers! What a sweet family tradition (yes, mean to pun here). 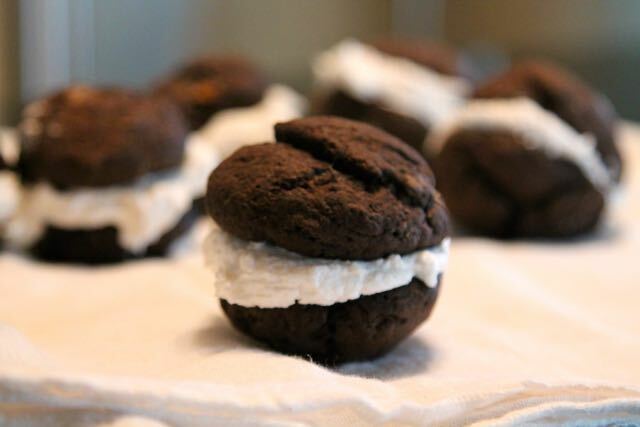 I used to make whoopie pies but haven’t made them in years. It’ sitme to surprise my family with this fun cookie. Such cute littles. I love that they seems so happy to help you get rid of those yummy Whoopie Pies!